Bikers for Trump is getting its pro-Trump t-shirts in Haiti because the prices in the US are too expensive. A shirt made in the US would cost about $US8 more, the group’s founder told the New York Times. Many of the group’s members are boycotting motorcycle maker Harley-Davison as it moves some of its production overseas to avoid extra costs from Trump’s trade war. Trump tweeted his support for a boycott of Harley-Davidson on Sunday, the same day that he met with Bikers for Trump. Bikers for Trump, a prominent Trump support group that has met the president numerous times, is making its pro-Trump t-shirts in Haiti because the prices in the US are too expensive. Chris Cox, the founder of Bikers for Trump, said in an interview with the New York Times that US manufacturers were too costly. “I looked far and wide to try to get a shirt made in America, it’s just they get you, they gouge you,” he said as he sold $US20 Trump shirts from his RV. As a result, his group gets its shirts made overseas – at the same time as Cox and other members say they will boycott motorcycle manufacturer Harley Davidson for deciding to make some of its motorcycles overseas as a result of EU tariffs created by Trump’s trade war. Harley-Davidson announced that it would move production of bikes for its European market abroad to avoid charging an extra $US2,200 per bike to European customers. 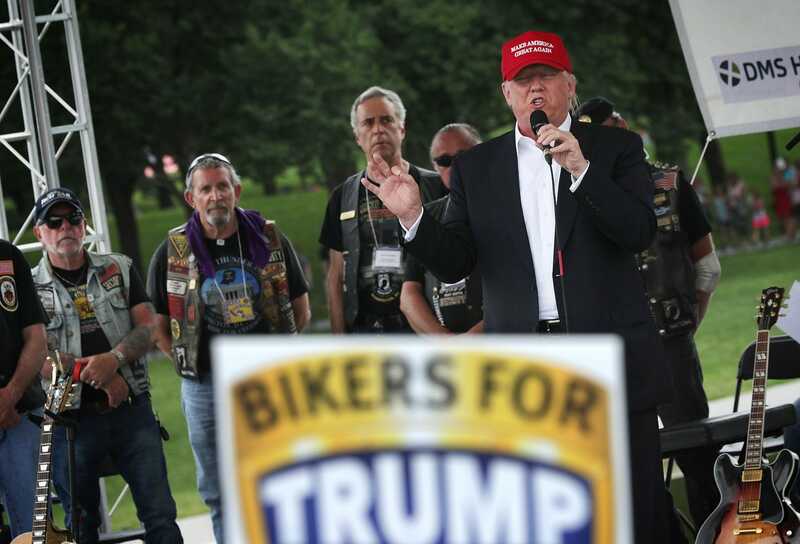 Trump expressed support for such a boycott of the company on Sunday, the same day that he met with Bikers for Trump. “Many @harleydavidson owners plan to boycott the company if manufacturing moves overseas. Great! Most other companies are coming in our direction, including Harley competitors,” he wrote on Twitter. Trump has met with the group numerous times. He met them on Sunday at his New Jersey golf club, where he posed for photos and selfies with its members. Trump also met with the group on his campaign trail in 2016. Cox also told the Times that Trump insisted that he visit the Oval Office because of his group’s support. Alex Wong/Getty ImagesTrump spoke to Bikers for Trump in 2016, when he was a presidential candidate. Not all of the group’s members support a boycott of Harley-Davison, with some telling the New York Times that the company’s move made business sense in light of the new tariffs.